Exactly sixty years ago today, on 4 October 1957, the Soviet Union launched the first artificial satellite, Sputnik 1, into orbit around the Earth. This is considered to be the beginning of the space age. Before this date there were no man made satellites in space but on every single day since then there have been artificial satellites around the Earth. Today there are over 1000 active satellites in orbit (Union of Concerned Scientists 2017) and many times that number of defunct ones. Sputnik 1 is shown above. It consisted of a shiny metal sphere, 58.5 cm in diameter, made out of an aluminium alloy. To the sphere were attached four radio aerials. Unlike later satellites, Sputnik 1 carried no scientific instruments and wasn’t fitted with a TV camera to take pictures. It had no solar cells to generate electricity and was powered by three non-rechargeable batteries. Its only piece of equipment was a radio transmitter, which transmitted regular pulses on two different frequencies: 20 MHz and 40 MHz. Anybody with a short wave receiver tuned to either of these frequencies could pick up Sputnik’s signal as it passed overhead. Despite its small size, it was also possible to view the satellite just after sunset or just before sunrise through binoculars. It appeared as a faint rapidly moving point of light. The year 1957 was during the cold war between the Eastern bloc – the Soviet Union and its allies – and the West. Before the launch of Sputnik, most people in America took for granted their country’s technological superiority. America had been the first country to develop the atomic bomb, led the way in computing and electronics and, in the years following the end of World War II, had been ahead of the Soviets in missile development. So most people naturally assumed that America would be the first country to place a satellite into orbit. 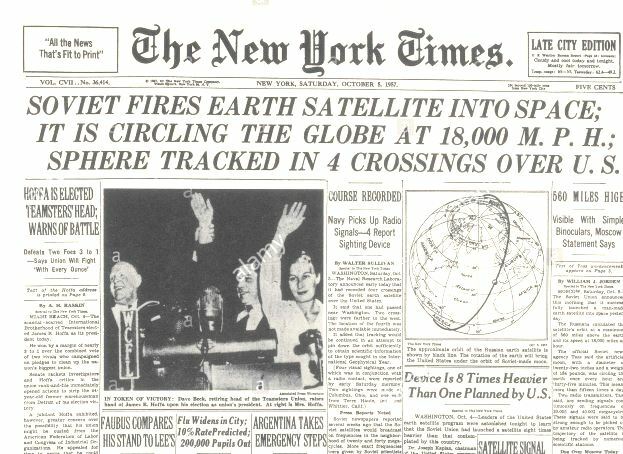 Front page of the New York Times from 5 October 1957- the day after the launch of Sputnik 1. The launch of Sputnik 1 caught many in America by surprise and led a lot of people in America to fear that Soviet technology had not only caught up with but also overtaken that of America. Many were fearful of the potential military implications of the launch. If the Soviets had built a rocket which was powerful enough to launch a satellite into orbit, then the same rocket could be be used to attack America with nuclear weapons. For this reason, the period of time immediately after the Sputnik launch is often known as the “Sputnik Crisis”. The Sputnik Crisis led to a big increase in US government funding for high technology industries such as missile defence. 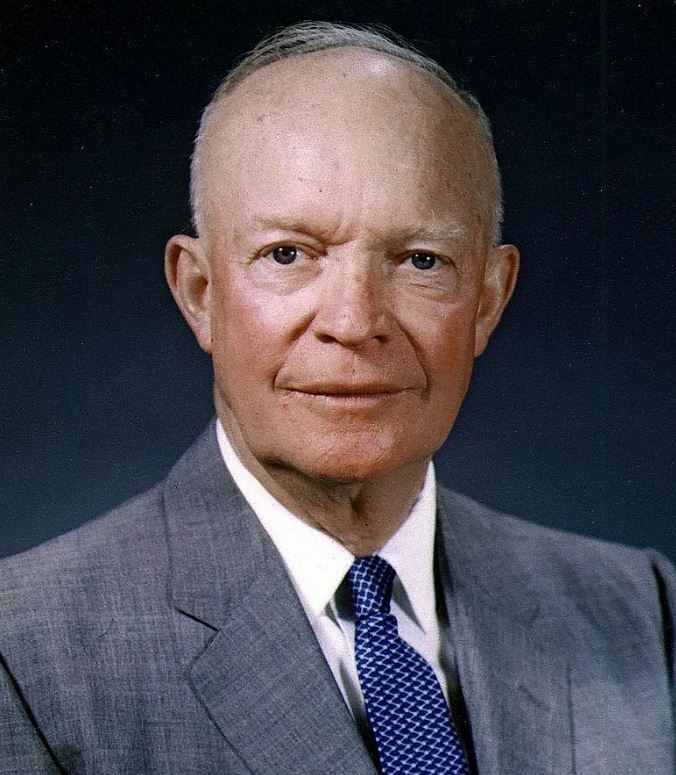 In February 1958, 4 months after the launch, president Dwight Eisenhower authorised the formation of the Advanced Research Projects Agency, later renamed the Defense Advanced Research Projects Agency (DARPA), within the Department of Defense to develop emerging technologies such as missile defence for the U.S. military. Note from Mrs Geek, the language consultant: this paragraph uses two spellings of the same word: the Science Geek is British so talks about ‘defence’, but he’s writing about an American agency with ‘defense’ in its title. As well as the formation of DARPA, the Sputnik Crisis also led directly to the passing of the National Aeronautics and Space Act and the creation of the National Aeronautics and Space Administration (NASA), a civilian-led organisation concerned with America’s non-military efforts in space exploration. As mentioned above, Sputnik 1 had no power source such as solar cells to generate electricity, so the batteries on board could not be recharged. After 22 days the spacecraft ran out of power and ceased transmitting, although it still remained in orbit and could be observed from Earth. 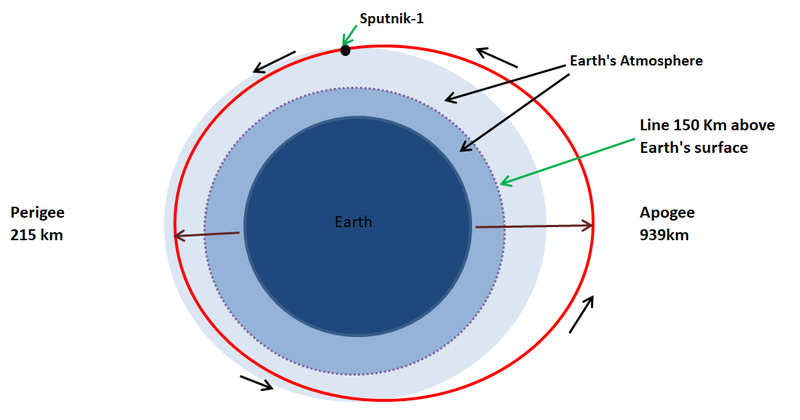 As shown in the diagram above, Sputnik was placed in an elliptical (oval-shaped) orbit. When it was closest to Earth – its perigee – it was 215 km away, and when it was at its its furthest – its apogee) it was 939 km away. Although 215 km is high enough above the Earth’s surface to be classed as space, at this altitude there are still significant traces of the Earth’s atmosphere. Every time Sputnik 1 dipped into the lower part of its orbit these thin traces of atmosphere slowed down the spacecraft, which was moving at around 28,000 km/h, by friction. This process, which is known as orbital-decay, caused Sputnik 1 to lose energy causing it to move slightly closer to Earth on each orbit. By 4 Jan 1958 Sputnik 1 had dropped down to an altitude of 150 km. At this altitude the traces of atmosphere were thick enough so that friction slowed the spacecraft down to a speed at which it could no longer remain in orbit. Sputnik 1 then fell back to Earth, the frictional heating causing it to burn up in the process. On 3 November 1957, one month after the launch of Sputnik, the Soviets launched another spacecraft, Sputnik 2. 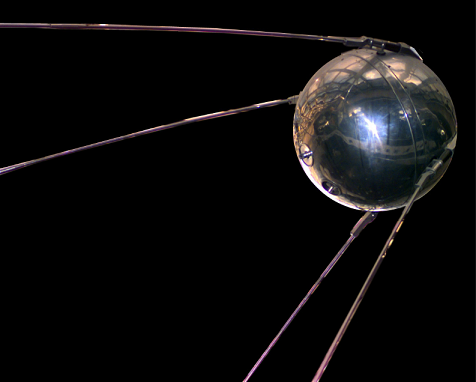 Sputnik 2 was much larger than its predecessor and had instruments to measure electrically charged particles, x-rays and ultraviolet emissions from the Sun. 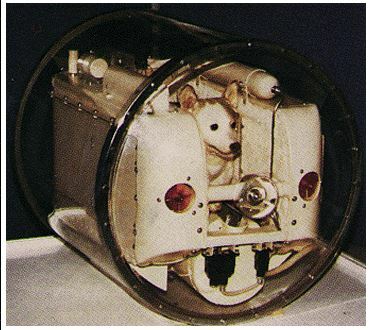 It also carried a passenger – a female dog called Laika, who became the first living creature to go into orbit. As you can see from the diagram above, it was a tight squeeze to get Laika into the capsule and for the duration of the spaceflight she was barely able to move. Sadly for Laika, it was a one way ticket. Sputnik 2 was placed into a similar elliptical orbit as Sputnik 1 and, like Sputnik 1, it was destined to burn up on its return back to Earth five months later. In 1957 the technology for a spacecraft to return safely back to Earth from orbit did not yet exist. In addition, Sputnik 2 could only carry enough food, water and oxygen for Laika to survive for 7 days. After the Sputnik-2 mission the official Soviet account was that Laika had survived a week in space and had been humanely euthanised by poisoning her seventh and final daily ration of food. This was the story which appeared in nearly all books on the early history of spaceflight written before 1990. After the fall of the Soviet Union in 1991, however, different accounts of the Sputnik 2 mission emerged and it was suggested that she had died much earlier in the mission from lack of oxygen, or when the cabin had overheated. This was confirmed in 2002, when Dimitri Malashenkov of the Institute for Biological Problems in Moscow stated that although she had survived the initial launch, she had died within a few hours from a combination of overheating and panic (Whitehouse 2012). For political reasons, the Soviets had rushed the launch of Sputnik 2 and did not have the ability in November 1957 to keep a small capsule at an even temperature. Despite surviving for a few hours in orbit, Laika’s place in the history of space exploration is assured. The information from Sputnik-2 proved that a living organism could tolerate a substantial time in weightlessness and paved the way for later human spaceflights in the 1960s. Today there are monuments to Laika in various places in Russia. The launch of Sputnik 2 caused widespread fear amongst many in the US government, who felt that the US was falling further behind the Soviets. This fear was compounded when the Americans attempted to launch their first satellite into orbit Vanguard Test Vehicle 3 (TV3) on 6 December 1957. 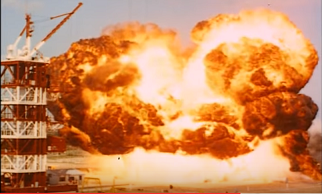 The launch was shown live on television all over the United States, but it proved to to be a PR disaster when, two seconds after lift off, the engines failed, the rocket fell back to the launch pad and the fuel tanks ruptured which caused the rocket to explode in a massive fireball. Despite the failure of Vanguard, the Americans successfully launched Explorer 1 into orbit in February 1958, marking the start of the space race between the two great world superpowers. At the beginning of this post, I mention that today is the 60th anniversary of the space age, so next year we will be remembering the 60th anniversary of the beginning of this competition between the Soviets and the Americans to achieve particular goals in space exploration. The impetus of the space race led the to the Soviets putting the first man in space in April 1961, and the Americans putting the first man on the Moon, in July 1969. I shall talk about the early days of the space race in my next post. Union of Concerned Scientists (2017) UCS Satellite Database, Available at:http://www.ucsusa.org/nuclear-weapons/space-weapons/satellite-database#.WZmxuPkrKUl (Accessed: 22 August 2017). Whitehouse, D (2002) First dog in space died within hours, Available at:http://news.bbc.co.uk/1/hi/sci/tech/2367681.stm (Accessed: 20 August 2017). I was 10 when Sputnik launched. I was able to see it go over our farm in the central U.S.
Laika was quite the pioneer dog, as were Belka and Strelka. Sputnik 1 was launched many years before I was born. It was amazing. I was a sciencegeek. Sputnik was a formative event in my life, deep and important, affecting my choices of career, and religions. I also had a plastic model of Vanguard which I painted and built with my Dad, a professor and chemist. I think the failure of its automatic controls showed me where the future was: There were problems there that needed solving, and space and computers were the means. I was lucky enough to learn to program in FORTRAN by sixth grade, and aerospace was a draw for a long time. Learned a lot. I think, in retrospect, that it was sad that this was done in the spirit of deadly rivalry rather than international cooperation. But, since, I have learned that people are not really up to being what some of us might hope them to be, at least not on a grand scale. At that scale, in my view, while there is technology and some understanding of Science, the interest in Science is ultimately utilitarian. And the people, for the most part, act as if they are little better than fellow hominids and primates, even if our time horizons are 20 years rather than a few months. Space is a wish that we were bigger and really understood our place in the Universe. We thoroughly don’t. And we might not make it to the world of Star Trek if we don’t figure out how to conquer the inner demons of Las Vegas and guns, or tar sands and profits. Thank you for a wonderful insight! Could you broaden the first sentence? What? “Sputnik was a formative event in my life, deep and important, affecting my choices of career, and religions”? I think the impact of Sputnik and the space program was that there were matters so different, so un-earthly if you will, and the perspective of Carl Sagan, who I did not read at the time, the Pale Blue Dot, affected my outlook. That people did not act as if it was fundamental kind of distanced me from ordinary social interchange. Also, while raised a Catholic, there was an increasing gap between that view of the world and one brought by Science, something I tried to reconcile, ultimately — and perhaps to an adult audience inevitably — failing to do so. For a time I considered myself a pantheist. Later, hoping to find in a much older religion and one more devoted to scholarship and, on its cultural face, rational analysis, I formally converted to Judaism. This was after meeting and marrying a woman who was a Jew. We raised two wonderful sons in that tradition. We separated and divorced, and I tried a more intense kind of Judaism for a time, daily practice in a kind of Judaism-Buddhism combo. But the daily practice seemed difficult and arbitrary, and it interfered with my being a proper parent, since my kids were fully integrated into society, and a lot of Jewish practice is about keeping separate from everyone else. So, I evaporated into atheism and physical materialism, where I remain. I am married again, very happily, and we belong to a great Unitarian Universalist congregation in Needham, primarily for reasons of having a shared community. There are quite a few overt atheists in its ranks. But I don’t do things like Easter, and I’ll attend a meeting of the Ethical Society of Boston on those days. A journey … Initiated by a loudly beeping satellite. Amazing post. As an Ex-Soviet I learnt many new things and details too. The suspicion and rivalry or those early days – was that what held back space exploration, I wonder? In my teens, I still fancied we (and maybe I) would actually get to Mars. Yes, Mars. I had hoped we would be more on the way. Of course, we have a few critical problems right here. In some sense and unfortunately, it’s irresponsible to do Mars and not make a big effort to solve climate. You make an an interesting point. However, I believe that the cold war rivalry between the superpowers lead to increased investment in space technology (by both America and the Soviet Union) and more ambitious timescales in the early days of the space race. 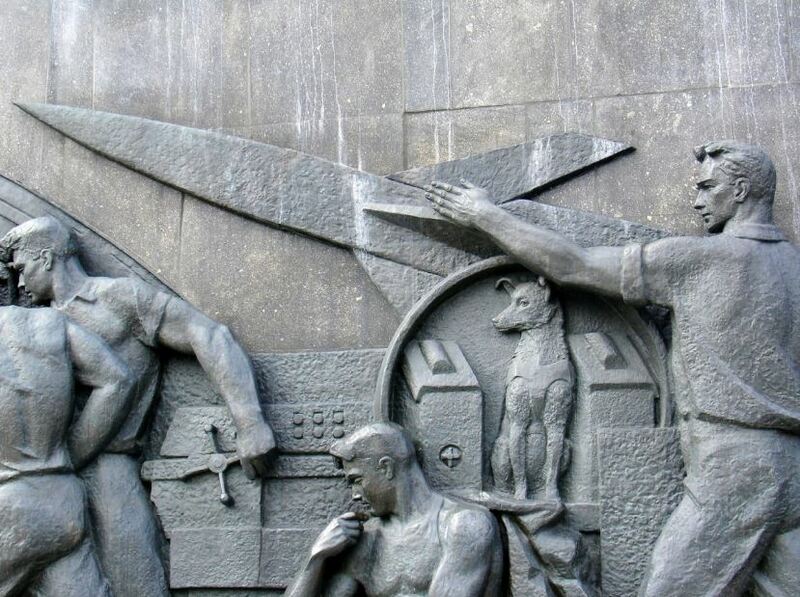 For instance ,the flight of Laika in Sputnik 2, was brought forward to coincide with the fortieth anniversary of anniversary of the Russian revolution. Yeah, but it also meant that once the goal of the Moon was achieved, Americans lost all interest in continuing the Science. It was launched.. i am was’nt born. .are you?? One wonders what it would take today — what kind of challenge, what kind of intellectual shock — in order to stimulate a similar focus on science and technology education and industry. The “Sputnik crisis” pretty much threw 1957-style social and political limitations on science out the window. What would it take to throw 2017-style limitations on technological development out the window? Inquiring minds want to know. Military and security concerns accentuated by the prestige factor. Or the world turning socialist. 4th of October is my bday! !